Apple announced today that the expected AppleTV software upgrade, which allows users to rent movies from their televisions, is not ready for prime time (no pun intended). 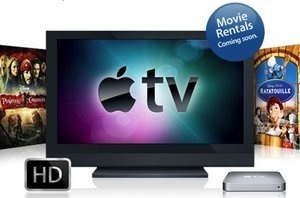 The update, due yesterday, will turn original AppleTVs into the AppleTV Take 2 announced earlier this month at Macworld. Apple says it will make the free software download available to existing AppleTV owners in another week or two . . . or three. The delay is not catastrophic, just disappointing, as original AppleTV owners have waited since the day they bought the set-top box to see what this device really can do. With all the major studios making content available on iTunes, it’s going to be a tantalizing wait for those of us who’ve waited long enough.